Vancouver, British Columbia, Canada. 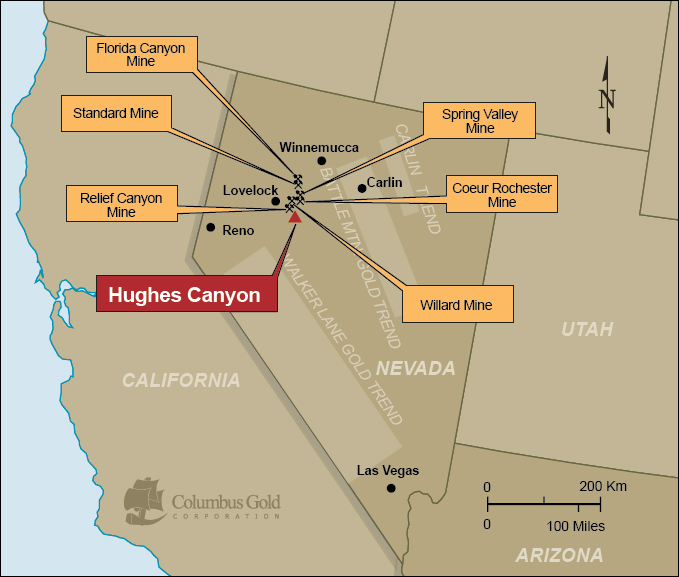 May 31, 2011, Columbus Gold Corporation (CGT: TSX-V) (the "Company" or "Columbus Gold") is pleased to announce the acquisition of the Hughes Canyon property, located 30 miles east-southeast of Lovelock, Nevada, on the west flank of the Stillwater Range in Nevada, bringing its total gold property portfolio to 25 projects. See location map below. At Hughes Canyon, historic surface sampling by Noranda, Independence Mining (Freeport), and a local prospector has yielded gold assays from anomalous to 4.9 g/t in both altered shales and jasperoids thought to be replacing limestones. The gold mineralization can occur over widths exceeding sixty meters (200 feet) as shown by fifty continuous channel samples taken by Noranda, in a drill road cutting lightly altered shale, which averaged 0.25 g/t Au and ranged from 0.04 g/t to 1.1 g/t Au. The property was drilled in the early 1990's., with vertical holes, by Independence Mining (Freeport) and Noranda. Most of the drill holes had numerous intercepts of anomalous gold, with thicknesses up to30 meters (100 feet). The best result was in drill hole RP-7 which cut 6 meters of 1.37 g/t (20 feet of 0.04 opt Au), including 2.8 m. of 4.32 g/t (5 feet of 0.126 opt Au). It is Columbus Gold's opinion that the better grade gold mineralization at Hughes Canyon is related to several high-angle structures and that the property needs drilling angled across these structures for a proper assessment of its economic potential. All claims in the project are subject to annual advance royalty payments to a local prospector, and a 1% gross royalty on eventual production. Columbus Gold is a gold exploration and development company operating in French Guiana and Nevada. In French Guiana, Columbus Gold recently acquired an option to earn a 100% interest in the Paul Isnard gold project, which has a 43-101 compliant 1.9 million ounce inferred gold resource and substantial expansion potential. In Nevada, Columbus is a prolific project generator focused on advancing projects either through joint-venture with industry partners or on its own where exploration risk is minimized and potential is particularly promising. President Andy Wallace has a long and successful history of gold discovery and mine development in Nevada. The Company currently has 12 of its 23 Nevada projects joint ventured to major and junior mining companies, including Agnico-Eagle Mines Limited.